People don’t usually associate women’s history with science, technology, engineering or mathematics. Maybe that’s why women’s and gender studies seniors Beatriz Castro and Puja Sharma chose those four disciplines for the theme of this year’s Women’s History Month events throughout March. 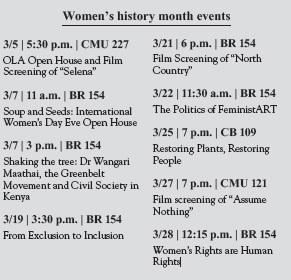 With a presentation by author and biologist Lisa Weasel, a lecture about women in sociology and another focused on Kenyan environmentalist Wangari Maathai, the events aim to break the barriers between women and male-dominated disciplines. Castro and Sharma said they hope providing information about women in history who have succeeded in those fields will give younger women someone to look up to. Fitting into the theme, the women’s center will host “Soup and Seeds” on March 7, the eve of International Women’s Day. A variety of soups will be served and heirloom seeds with recycled pots will be handed out to plant. The goal is to create some excitement around organic, locally grown foods. This month will also feature a number of other events including a documentary about transgenders, a film about sexual harassment and a lecture about women’s rights. To prove that point, Castro and Sharma invited two male professors to speak at this month’s events. Bruce Roberts, an anthropology professor, will speak about Wangari Maathai and The Greenbelt Movement, which is an environmental organization Maathai formed to empower communities to conserve the environment and improve livelihoods. Maathai was a Nobel Peace Prize laureate and the first woman in east-central Africa to earn a doctorate degree. “(Roberts) is very passionate about conservation issues, and Wangari Maathai is one of his personal heroes, so we thought who better to talk than Dr. Roberts,” Sharma said. All of the women being featured throughout the month of March have worked for social justice for everyone, not just women. “They’re people who are thinking about how oppression and discrimination work in our society as a whole,” Bender said.